Bagchen, sometimes written as Pagchen, is a Tibetan domino game for four players using a double set of Chinese dominoes: 64 tiles. Travellers to Tibet report that it is still a popular game in rural areas, played mainly by older people. This page is based mainly on information from the Austrian Shang Shung Institute, which formerly published a set of rules on their web site and sold the tiles for the game. Bagchen is an expanded version of the Chinese game Tien Gow (Sky Nine): it uses the same division of the tiles into two suits and similar ranking within the suits. As in Tien Gow the main objective is to win the last trick, and it is possible to lead combinations of dominoes, in which case a multiple trick is played. When written out, the rules of this game look rather complicated, and new players may be discouraged at first by the need to memorise the seemingly arbitrary ranking of the tiles. Those of us who have tried it can reassure you that the effort is worthwhile. It is not as difficult to learn as you might expect, and once you master the rules, the game goes quite quickly and is very enjoyable to play. Bagchen is for four players, with no partnerships. Play is clockwise. two each of the tiles [6-3], [5-4], [6-2], [5-3], [5-2], [4-3], [4-2], [4-1], [3-2], [2-1]. Two six-sided dice are also needed. 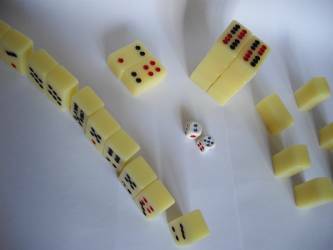 Ideally Tibetan dominoes and dice should be used: the tiles are similar in size and shape to Mah Jong tiles. The illustrated set came in a plastic case labelled in Chinese 藏牌 (Zàng pái), which just means "Tibetan tiles". When looking for sets to buy it is worth searching under various spellings such Bagchen, Pagchen, Bakchen or Pakchen. Pagchen sets are available from the USA online store of the Shang Shung institute. Sets can also be bought in Lhasa: many of them are manufactured in Hong Kong. 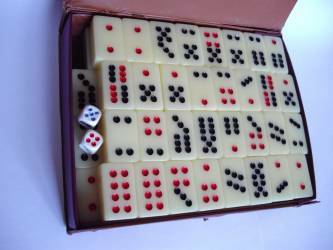 If you have no Tibetan dominoes, it is possible to play with two 32-tile sets of ordinary Chinese dominoes and two Chinese dice, or even to make up an equivalent, though less authentic set from four 6-6 sets of Western dominoes and two Western dice. It is convenient to use chips for scoring. Each player should begin with an equal number of these. All the tiles are distributed to the players as described below, so that each has 16. The tiles are played in single or multiple tricks as follows. One player leads a tile or set of tiles, placing them face up in the middle of the table, side by side. The next player to the left must play an equal number of tiles. If they beat the tiles on display, they are placed face up on top of those tiles. If not, they are placed face down under the tiles previously played to the trick. Then the third player, opposite the player who led, must play in the same way, and finally the fourth player. When all four players have played, the trick is complete. There will be a stack of tiles in the middle of the table, which will be four tiles high and one, two, three or more tiles wide, depending on how many tiles were led. The winning tile or set of tiles will be face up on top of the stack. The person who played this winning tile or set takes the stack, stores it to his or her left alongside any previously won stacks, and leads a tile or set of tiles to the next trick. When more than one tile is led, the resulting stack counts as that number of tricks, so there are always 16 tricks in all. As a part of the dealing process the two dice are thrown, and this throw designates four tiles which are known as points for the duration of the play. A point tile cannot beat any other tile, but if it is led nothing can beat it. Moreover, a player who leads a point tile is immediately paid by the other players. The player who leads to a trick is subject to certain constraints on what tiles or sets of tiles can be played. These will be explained below. Any of the other three players who choose to play face down are under no constraint except that they must play same number of tiles as the player who led: they can play any tiles that they wish to get rid of, without any requirement to “follow suit”. A player who wants to play face up and potentially win the trick can only do so by playing a tile or combination that beats what is currently face up on top of the trick, as described in the next section. The play continues until all the tiles have been played. Then the player who won the final trick is paid by (or in some cases pays) the other players according to the number of tiles they have won. If the last trick is won with a point tile, the payments are multiplied by a factor which depends on the number of consecutive tricks at the end that are won with points. The greatest rewards in the game are won this way, but the player who attempts to win with points at the end runs a greater risk of losing instead. The detailed procedures for distributing the tiles, winning tricks and calculating payments will be described in the following sections. Any single tile can be led. A tile can be beaten only by a higher tile of the same suit. Sky tiles cannot beat earth tiles and earth tiles cannot beat sky tiles. So for example a [5-3] can only be beaten by a [6-3] or a [5-4]: not by a [6-6] because it is the wrong suit, and not by a [6-2] because it is equal, not higher. A sister, such as [3-3], can only be beaten by a [6-6], [1-1], [4-4] or [3-1]. A [5-1] can be beaten by those tiles or by any sister, but not by another people tile such as [6-5] and not by any earth tile. It is necessary to understand which combinations of tiles can be led together, and which combinations can beat other combinations. Any set of two, three or four identical sky tiles can be led together. Such a combination can only be beaten by an equal sized higher identical set of sky tiles. For example [6-4][6-4][6-4] can be beaten by [2-2][2-2][2-2] or [1-1][1-1][1-1] but not by [2-2][3-3][3-3] or [6-6][4-4][3-1] (not identical) and not by [6-5][6-5][­6-5] (not higher) and not by [6-6][6-6] (wrong number of tiles). Any set of two, three or four equal (but not necessarily identical) earth tiles can be led together. Such a combination can only be beaten by an equal sized higher set of equal earth tiles. For example [4-3][5-2] can be led together, and can be beaten by [6-2][6-2] or [6-3][5-4] but not by [6-3][6-2] (not equal) and not by [6-6][6-6] (wrong suit). Any set of two or more ministers can be led together. They can only be beaten by an equal sized combination of chiefs, containing the same numbers of sky and earth tiles as the ministers to be beaten. For example, [1-1][6-2][5-3] can be led, and can be beaten by [6-6][5-4][5-4], but not by [6-6][6-6][6-3] (wrong mixture of sky and earth). Any set of chiefs can be led together and cannot be beaten. Below the rank of minister no combinations of mixed sky and earth are allowed. This is a difference from Tien Gow – for example in Bagchen [4-4][5-2] is not a legal combination to lead. Mother and son form a special combination [4-2][2-1]. This combination cannot beat anything, but these two tiles can be led together, and when led together they cannot be beaten. Mother and son led together also count as a point (see below). [4-1][2-1] is the mare and [4-3][4-2] is the stallion. Either of these combinations can be led. The mare can only be beaten by the stallion, and the stallion cannot be beaten at all. Mare and stallion together form the complete horse [4-3][4-2][4-1][2-1]. This four-tile combination cannot beat anything but when led it cannot be beaten. Although it contains the mother and the son, it is not a point. It is also possible to lead a double mare or double stallion (four tiles each). A double stallion beats a double mare. A double mare does not beat anything and a double stallion cannot be beaten. Points are special tiles or combinations which cannot beat anything but cannot be beaten when led. A player who leads a point not only automatically wins the trick, forcing the other players to play tiles face down, but is also paid by the other players. Winning the last trick with a point is especially profitable. if the dice designate either mother (4 and 2) or son (2 and 1) then both the mother tiles and both the son tiles are points. It is possible to lead two or more point tiles together, but a combination cannot consist partly of point and partly of non-point tiles. This, together with the fact that point tiles cannot beat or be beaten, has the following consequences. If 6-6 is the point, [1-1] and mixed ministers are unbeatable. If 5-4 or 6-3 is the point, [6-2], [5-3] and mixed ministers are unbeatable. If 1-1, 6-2 or 5-3 is the point, mixed ministers cannot be played. If 7 of earth (4-3 or 5-2) is the point, the stallion ([4-2]+[4-3]) cannot be played and mare ([4-1]+[2-1]) is therefore unbeatable. Also the complete horse ([4-3]+[4-2]+[4-1]+[2-1]) cannot be played. If 5 of earth (4-1 or 3-2) is the point, neither the mare ([4-1]+[2-1]) nor the complete horse ([4-3]+[4-2]+[4-1]+[2-1]) can be played. If mother (4-2) or son (2-1) is the point, stallion, mare and complete horse are all unplayable. In addition to the point determined by the dice throw, mother and son are always a point when led together. If mother and son are points in their own right they can still be led together, and in this case they count as three points: one for each tile and one for the combination. If you follow the authentic formal procedure, the allocation of seats depends on the throw of dice and the time of day. All four players in turn throw the two dice. If it is morning, the player who throws the highest total sits in the East seat, the second highest sits South, the third highest sits West and the lowest North. If it is after noon the player who throws lowest sits East, the second lowest South, the second highest West and the highest North. If two or more players throw the same number, they throw again to decide which of them is higher. East is the starting player for the first hand. Subsequently, the player who wins each hand is the starting player for the next. Alternatively, in an informal game, the players may sit anywhere they choose, and they throw dice only to determine who will start the first hand. Any player throws the dice and the total on the dice is counted clockwise starting with this player. The player on whom the count ends throws the dice again, and again the total is counted around the players. The player on whom this second count ends is the starting player for the first hand. Example: South throws 5-2; the count of 7 ends at North; North throws 4-4; the count of 8 ends at West; West is the starting player. The tiles are placed face town on the table and shuffled thoroughly. Then each player builds a wall four tiles long and four tiles high, and divides it into two towers four high and two wide. The eight towers, two in front of each player, form an octagon – see diagram. The player opposite the starting player (i.e. West in the first hand of a formal game) chooses which tower will be taken first, points to it without touching it and then throws the two dice. The numbers thrown determine the point for the hand and are also use to decide who will take the first tiles. The player who threw the dice counts around the players clockwise, starting with himself, from 1 up to the total on the dice, and the player with whom the count ends takes the chosen tower. The next player to the left takes the next tower in clockwise order and so on until everyone has 16 tiles (two towers). For example if South is the starting player, and North throws 6 and 4 then [6-4] is the point for this hand and East takes the tower chosen by North (because the count to 10 ends with East). If North had thrown 4 and 1 then both [4-1] and [3-2] would have been points (since 4-1 belongs to the earth suit) and North would have taken the chosen tower. Players arrange their 16 tiles in front of them in such a way that they can see their faces but their opponents cannot. The two dice remain on the table displaying the point until the end of the hand, and must be returned to that state after being used for any other purpose. There are three further possible steps before the play begins. A player who has a very poor hand may demand a re-deal. “Very poor” means no tile of the highest or second highest rank in each suit. Points are not counted as high tiles, since they do not beat anything, so if the point is 6-6 or 1-1, the [4-4] is the second highest sky tile, and if the point is 6-3, 5-4, 6-2 or 5-3, sevens ([5-2] and [4-3]) are the second highest earth tile for this purpose. So there are always 16 tiles that disqualify a player from demanding a re-deal. A player who has none of these 16 tiles may, if he wishes, expose all his tiles to prove that he has no high ones. The shuffling and dealing process must then be repeated (with the same starting player as before). If one player has all four chiefs of sky (all the [6-6] tiles) and they are not points, he or she must expose these tiles to the other players. The game continues, and the other players can adjust their strategy in the light of this information. If one player has a mother [4-2] and another a son [2-1], they may be brought together, if both players agree to do so, provided that the mother and son are not points, by the following method. Any player who holds a [4-2] may place it face up on the table saying “mother looking for son”, upon which anyone who holds a [2-1] can accept the offer by also putting it face up on the table. Or similarly the holder of a [2-1] can show it, saying “son looking for mother” and the holder of a mother can accept the offer. When an offer is accepted, each of the two players throws one die, and the player who throws higher takes both tiles. (If they throw equal numbers, both throw again.) Now the player who threw lower has only 15 tiles. This player throws both dice, and the other player, who has 17 tiles, must if possible give the tile indicated by the dice to the player who has 15, unless the indicated tile is the mother, the son or the point. If the dice indicate an earth tile that the 17-tile player does not have, the equivalent tile must be given instead – for example [4-3] if 5-2 was thrown and the player does not have a [5-2]. If the throw was a point, a mother, a son, a sky tile that the 17-tile player does not have, or an earth tile for which the 17-tile player does not have an equivalent, the dice must be thrown again until they indicate a tile that can be given. After this the dice must be reset to show the point which was determined during the deal. Example. The point is 6-2. South places a [2-1] face up: “son looking for mother”. West accepts by placing a [4-2] face up. South throws 3 and West throws 4. West takes the mother and son. West throws 5-3 but this is a point. West tries again and throws 5-5 but South does not have a [5-5]. West next throws 4-2 but that is mother. Then West throws 5-4. South does not have a [5-4] but does hold a [6-3]. South must give a [6-3] to West. If one player has both mothers and another player has both sons, they can agree to exchange one of these tiles without throwing dice so that each of them has a mother and son combination. Note that if the point is 4-2 or 2-1, there can be no exchanging of mothers and sons. Play a tile or combination that beats the highest tile or combination so far played, putting it face up on top of the tiles that were previously winning. Play the appropriate number of tiles face down, without showing them to the other players, placing them under the stack of played tiles. A single tile can only be beaten by a higher single tile of the same suit, and an ordinary combination only by a higher combination of the same suit. Point tiles and certain special combinations cannot be beaten. Details are given in the suits, ranking and combinations section above. When everyone has played to the trick, the tiles will be stacked four high with the winning tile or combination on top. These stacked tiles are placed to the winner’s left, and count as one, two or more tricks depending on the number of tiles that were led. The winner of the trick(s) leads to the next trick. A player who has won six or more tricks is said to have a passport. This player is exempt from all future payments during the hand, but may still receive payments, including a payment from the winner of the last trick if the passport holder ends with seven or more tricks. On the other hand, a player with a passport is subject to extra constraints on what tiles can be led to a trick. The only tiles and sets of tiles that the passport holder is allowed to lead are those permitted by the passport rules 1-4 below. These constraints are designed to make it hard for this player to win the last trick. Note that these constraints only apply when playing first the first tile(s) to a trick. If you lost the previous trick and another player is leading, you are free to play any tiles you wish as usual, even if you have a passport, but if you win a trick while holding a passport your permitted leads to the next trick are once more limited by the rules below. Any unbeatable tile or combination, including any points. When deciding whether a tile is unbeatable, tiles previously played face up are taken into account. So for example if two [6-3] tiles and a [5-4] have been played face up and 6-2 is the point, then a set of [5-2]+[4-3] is unbeatable and can therefore be led by a passport holder. Any set of two or more sky tiles except the lowest ones (so a for example pair of [3-3] is OK but a pair of [6-5] is not). A passport holder whose hand consists only of points together with just one tile or combination can lead this tile or combination, keeping only points. Any special combination (including the mare: [4-1][2-1], which may be beatable). Any sky combination, even of the lowest sky tiles such as [6-1][6-1] or [6-5][6-5]. A passport holder who has no unbeatable tiles, no set of sky tiles and no special combinations may lead a combination two or more equal earth tiles, and must expose his or her tiles on request to prove that this lead is legal. A passport holder who has to lead to a trick, but has no unbeatable tiles and no combinations at all must expose his or her tiles to the other players, laying them all face up. If they are all the same suit, the passport holder may lead any of them. If they include both earth and sky the passport holder must throw the two dice to choose a suit: earth or sky. The player may then lead any tile of the suit indicated by the dice, after which the dice must be reset to show the point for the current hand. A player without a passport may lead a single tile face down, and optionally name a suit (earth or sky). The tile played is not revealed and does not have to belong to the named suit. This face down tile can be beaten by any single tile of the named suit, or by any single tile at all if no suit was named. If all four players play face down, for example because the first player plays face down and nominates earth, but none of the other players has an earth tile that they wish to play, then the player of the first tile wins the trick. It is convenient to use chips for scoring since there are payments both during and at the end of the play. A player who wins a stack by playing a point tile is immediately paid one chip by each opponent who does not have a passport. If several stacks are won by leading several point tiles together, the player is of course paid a chip for each tile. Since the mother and son combination is a point, a player who leads these is immediately paid a chip by each opponent who does not have a passport. If the mother and son tiles are also point tiles in their own right, the payment is three chips instead of one – one for each tile and one for the combination. The winner of the last trick settles up with the other players as follows. Each player who has fewer than six stacks must pay the difference between six and the number of stacks they won. For example a player with two stacks pays 4 chips to the winner of the last trick. A player with exactly six stacks neither pays nor receives anything. A player with more than six stacks is paid one chip for each stack over six. For example a player with 8 stacks is paid 2 chips by the winner of the last trick. The net result for the winner of the last trick will always be a profit of 2 plus the number of stacks this player won. If the last trick was won with a point, or a consecutive series of tricks at the end were won with points, this is called a jump. In this case, there are no single chip payments for these final points. Instead, all the final payments are multiplied by twice the number of points that the winner of the last trick played consecutively at the end. For example, if a player wins the third last stack with the [6-6] and then plays mother and son, winning the last two stacks, then a player with four stacks must pay 4 chips to the winner of the last trick instead of two. If [3-3] is the point, a player wins a double earth trick with the [6-3][5-4] and then produces [3-3][3-3][4-2][2-1] as his last four tiles, he has jumped with three points at the end, and the payments are therefore multiplied by six. A player with one stack must pay him 30 chips (2×3×5). Note that the maximum number of points potentially available in a deal is always six: four points determined by the dice and two mothers and sons. Therefore the maximum multiplying factor for the final payments is 12. A player who manages to win all sixteen tricks wins all the chips on the table, ending the game. To end the session, one of the players can declare Gobah, after which five more deals are played, the final deal being known as Tashi Gobah. Alternatively, if time is short, players may agree to play just one more deal, the Tashi Gobah. A player who considers that he or she is having a run of bad luck may try to change this by requiring a change of seats. This can be done immediately before the tiles are shuffled for a new hand. To determine the new seating everyone throws the dice as at the start of the session. The player who demanded the exchange of seats does not move, but the other three move as necessary so that the four players are sitting in decreasing order of dice throw counting clockwise in the morning or in increasing order clockwise in the afternoon. After the deal but before looking at any of their tiles, any two players may agree to exchange hands. Traditionally the dice showing the point are kept to the left of the starting player. Tricks are stored to the left of the player who won them, in a row that grows towards the centre of the table as tricks are added. They are placed there by the last player to the trick if he or she wins it, but otherwise by the player to the left of the one who won the trick. Any player who is not sure what to play may throw the two dice and interpret the result as a hint. The interpretation is up to the player. The dice must be reset after use to show the point for the current hand. If you hold three sky chiefs ([6-6]), it is a very bad omen if the player opposite you wins the last trick, so that you have to salute this player by throwing the dice for the next deal. Winning any of the final five hands after Gobah is declared is good luck, especially the very last hand (Tashi Gobah). Winning none of the five Gobah hands is an indicator of future bad luck. It is said that the exact rules for what can and cannot be led by a player with a passport vary from place to place, and this is easy to believe since they are rather elaborate. However, all the descriptions I have seen so far give the same passport rules, perhaps indicating that they all have a common source. Some set the “jump factor” higher than 2, up to a maximum of 6. This must be agreed at the start of the session. For example with a factor of 4, then in case of a jump, the final payments are multiplied by four times the number of points played at the end. A detailed description can be found in this archive copy of the Bagchen rules page of the Shang Shung Institute for Tibetan Studies (SSI) in Austria. The rules there were written by Igor Berkhin, who learned the game from Chögyal Namkhai Norbu. Here is an archive copy of the Rules of Bag Chen which were published on the Digital Gamers (DG) site. They are said to have been pieced together from many sources, but unfortunately no references are given. They agree fairly closely with the SSI rules with a few exceptions. In the DG version mixed minister leads are restricted to a maximum of four tiles. Also the DG authors imply that it is compulsory to beat the highest tiles so far played to a trick when able to do so, but this is probably a misunderstanding: there is no such rule in the SSI version nor in the simpler game Tien Gow on which Bagchen is based.